(Sousa chinesis) and an endless list of other species and subspecies will also feel the effects of the resulting changes in fresh water flow, loss of habitat and the pollution that will be caused by the factories, we have neither the manpower nor, for all we know, the capacity on our server to write in detail about all of those in danger, so here is just a little about the Fairy Pitta. Also, if you sympathise with our protest against the Hushan Dam project, you can help us by signing our petition. The movement against this project is a joint effort by numerous environmental groups and individuals across Taiwan, and although the voices calling for construction are loud and backed with more money than we could ever imagine, we are still hearing encouraging noises from many people interested in helping and we are still fighting to save the area and its inhabitants. The Hushan Dam project is also a huge drain on the resources of Wild at Heart and our co-campaigners, so another way you can help is to make a donation. Please write to us at comment@wildatheart.org.tw with any questions. 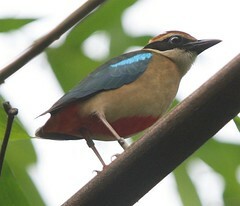 The Fairy Pitta (Pitta nympha) is one of several species previously known collectively as the Indian Pitta1. It belongs to the Pittidae family of the order Passeriformes. A migrant songbird, it is distributed in Hainan Island, Vietnam and possibly Southern China in the winter, and flies to Taiwan, South Korea, Japan and Southeastern China to breed in the summer. Sightings have also been recorded in Borneo and Australia. 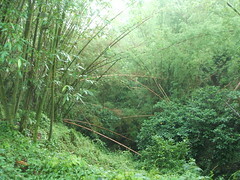 The Pitta nests in many parts of Taiwan. 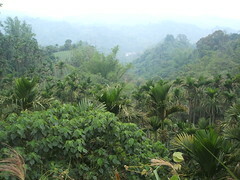 The Huben (湖本) area in Yunlin County (雲林縣) has records of consistently large numbers, and is believed to be the most densely populated Pitta habitat in the country. Adult Pitta arrive in Taiwan in early April to reclaim familiar old breeding grounds, and return with their young to their wintering grounds in Autumn. The peak breeding season is in May and June, and it is from late April until early May that the male Pitta’s call can be heard most frequently - two consecutive notes with an interval of a semi-tone or a whole tone. This serves as both a mating call and as a territorial warning signal to other males. It can be heard calling up to a mile away in the forest. A pair of Pitta will build their nest using bamboo leaves, plant fibres, twigs and small branches, and will line it with soft mosses and plant fibres. It is compact and round, with the entrance on one side, and the colours of the materials selected provide an effective camouflage. They may choose to build it in the crevices of tree roots or rocks on the steep, dark, moist slopes of a mountain ravine, or higher up in the foliage at the top of a tree trunk, at heights ranging from one to five meters above the ground. The entrance, however, will be placed in a spot without much vegetation, for ease of access, and to avoid attack by predators that could conceal themselves amongst leaves. Caution is also exhibited each time the Pitta returns to its nest throughout the breeding process. It will often perch nearby, scanning the area for danger, and then take an indirect flight path back to the nest. After split-second copulation, the female will form and lay an egg every day. She will usually lay four or five, while six eggs are possible but very rare. She and her mate will wait until she has laid her last egg before taking turns to incubate them, a process that lasts two weeks. In this way they can be sure that all eggs will hatch at the same time, which is more efficient and less troublesome for the pair than if they were to hatch separately, as much energy must be spent searching for food as soon as the young have hatched. Throughout the following weeks, the parents continue to exercise caution by removing from the nest any sources of odor that might attract predators. For example, they will eat the shells of the newly-hatched young, as well as their partially-digested feces, and once the young are able to fully digest their food, the parents will remove the feces to a place far from the nest. As soon as the eggs are hatched, the parents share the work of looking for food and caring for the hatchlings. The main diet of the Fairy Pitta is earthworms, for which they rummage in the soil, but they are also known to eat other insects as well as snakes, lizards and small rodents. They will forage in a territory of three to ten hectares, depending on the abundance of food. Feeding become busier as the young grow larger and hungrier, as well as during the sudden, heavy rain storms that often occur during this period, which coincides with Taiwan’s “plum rain season” (mei-yu-ji 梅雨季) , with the drop in temperature increasing the fledglings’ appetite. Eventually, after two weeks of growth and wing formation, the parents will use earthworms as bait to coax the young out of the nest, encouraging them to take flight and start foraging for themselves. Known in Mandarin Chinese as the “Eight-colour bird” (ba-se-niao 八色鳥), the Fairy Pitta is best-known for its beautiful colouring. Aside from white, two shades of brown, green, yellow, black and a red pigment on the underside, it is the striking, shiny blue on its wings that has earned it another nickname – the “jewel” of the forest. It is believed that this glittering effect is caused by a layering in the wing feathers. The light and dark brown patterning on the top of the head provides a leaf-like camouflage at the entrance to the nest as the parents incubate the eggs. The young, too, are protected by darker, less eye-catching colours such as browns and black. A larger white wing spot distinguishes the male from the female. 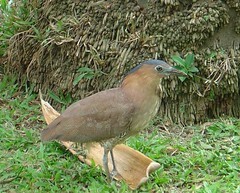 The Malayan Night Heron (Gorsachius melanolophus 黑冠麻鷺) and the Emerald Dove (Chalcophaps indica 翠翼鳩) also forage the dark forest undergrowth in places such as Huben. 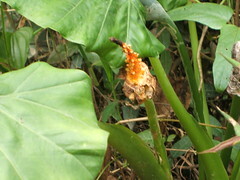 One ubiquitous plant, the Giant Elephant Ear (Alocasia macrorrhiza 姑婆芋) provides a juicy red fruit of which the Emerald Dove is particularly fond. The Asian Crested Goshawk (Accipiter trivirgatus 鳳頭蒼鷹), with its keen eyesight, is the principle natural enemy of the brilliantly coloured Fairy Pitta. Snakes are also a threat, as are ants, which can invade an unguarded nest and kill the young. 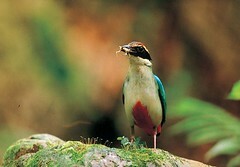 The main threat to the Fairy Pitta is habitat destruction. Most of the Pitta’s lower-elevation habitat has already been destroyed for human development. The Huben area in Yunlin County has also suffered in recent years from gravel extraction, which has stimulated protest amongst people concerned for the survival of animals such as the Pitta. 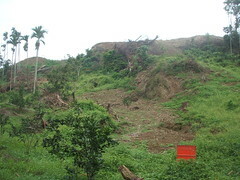 Protests by locals including village warden Yin Lin-in (尹伶瑛), now a Yunlin County legislator and an active opponent of the Hushan Dam project, have helped bring gravel exploitation in check, but not before large sections of hillside, including stream areas important to the Pitta, had been stripped of vegetation and mined. The scars of mining and the resulting erosion are still evident. 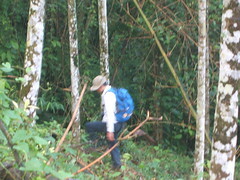 It was this issue that first brought a Birdlife International team to Taiwan to express concern about the Pitta habitat. Presently the greatest threat to the Pitta population in Huben is the controversial Hushan Dam project, which threatens to submerge 422 hectares of lush habitat. However, other problems persist, notably the intrusion of photographers directly into the breeding areas of the Pitta during the critical breeding weeks. Rainforest destruction in Fairy Pitta wintering lands such as Borneo is also believed to pose a great threat to the survival of the species. 1Species previously all known as Indian Pitta are now categorized as Indian, Mangrove, Blue-winged and Fairy Pitta. Interviews and tour with Scott Lin (Lin Ruey-shing 林瑞興), researcher at Taiwan Endemic Species Research Institute (TESRI) and Mark Wilkie, 29 April 2006. Pitta, the fairy of the forest (八色鳥：密林中的精靈), DVD, TESRI. For more photos of the Fairy Pitta, click here.